HENDERSON, David Bremner, a Representative from Iowa; born in Old Deer, Scotland, March 14, 1840; immigrated to the United States with his parents, who settled in Winnebago County, Ill., in 1846; moved to Fayette County, Iowa, in 1849; attended the common schools and the Upper Iowa University at Fayette; enlisted in the Union Army September 15, 1861, as a private in Company C, Twelfth Regiment, Iowa Volunteer Infantry; was elected and commissioned first lieutenant of that company and served with it until discharged, owing to the loss of a leg, February 26, 1863; commissioner of the board of enrollment of the third district of Iowa from May 1863 to June 1864; entered the Army as colonel of the Forty-sixth Regiment, Iowa Volunteer Infantry, and served until the close of the war; studied law; was admitted to the bar in 1865 and commenced practice in Dubuque, Iowa; collector of internal revenue for the third district of Iowa from November 1865 to June 1869 when he resigned; assistant United States district attorney for the northern district of Iowa 1869-1871; elected as a Republican to the Forty-eighth and to the nine succeeding Congresses (March 4, 1883-March 3, 1903); chairman, Committee on Militia (Fifty-first Congress), Committee on the Judiciary (Fifty-fourth and Fifty-fifth Congresses), Committee on Rules (Fifty-sixth and Fifty-seventh Congresses); Speaker of the House of Representatives (Fifty-sixth and Fifty-seventh Congresses); declined to be a candidate for renomination in 1902; died in Dubuque, Iowa, February 25, 1906; interment in Linwood Cemetery. Papers: ca. 1884-1951, 3 linear feet. The collection of David Bremner Henderson contains mostly newspaper clippings, biographical in nature, much of which is duplicated in the Biographical Directory of the American Congresses, 1774 -- 1961, and The National Cyclopaedia of American Biography. A finding aid is available in the repository and online. Papers: 1896, 1 item. A letter from Henderson to J.H. Brewer written on February 29, 1896. In the letter, Henderson writes regarding a previous favor; mentioning a letter to the governor. Papers: In the Albert N. Harbert Collection of Railroadiana, 1867-1937, 1 linear foot. Other authors include Henderson. A finding aid is available in the repository and online. Papers: In the William Titus Rigby papers, 1839-1988, 4 linear feet.. Other authors include Henderson. A finding aid is available in the repository and online. Papers: In the John Milton Hay correspondence, 1854-1914, approximately 6,000 items. Other authors include Henderson. Papers: 1856-1906, 3 inches. Includes correspondence, speeches, newspaper clippings, obituary and eulogies. Finding aid in repository. Papers: In the Henry H. Markham papers, ca. 1867-1899, 2615 items. Henderson included among persons represented. Papers: In the William Larrabee collection, 1863-1903, 41 letters. Persons represented include Henderson. Papers: In the James Carson Needham papers, 1893-1936, 6 linear feet. Subjects include Henderson. A finding aid is available in the repository and online. Papers: 1876-1906, 2 folders. Henderson's papers contain personal and business papers, photographs, and memorabilia. Also included is material in the John Kasson, E.M. Sargent, Leavitt Family, Alonzo Abernethy, J.L. Waite, and W.W. Warner collections. Papers: In the Oliver Lyman Spaulding papers, 1861-1921, 3 linear feet. Other authors include Henderson. A finding aid is available in the repository. Papers: In the William D. Washburn papers, 1846-1912, 6 folders. Correspondents include Henderson. A finding aid is available in the repository. Finocchiaro, Charles J., and David W. Rohde, "Speaker David Henderson and the Partisan Era of the U. S. House," in David W. Brady and Mathew D. McCubbins, eds., Party, Process, and Political Change in Congress, Volume 2. Stanford, CA: Stanford University Press, 2007: 259-270. Hoing, Willard L. "David B. Henderson: Speaker of the House." Iowa Journal of History 55 (January 1957): 1-34. Perkins, George Douglas. David Bremner Henderson. [Dubuque? : N.p., 1906]. Schlup, Leonard. 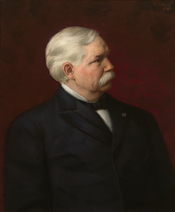 "Defender of the Old Guard: David B. Henderson and Republican Politics in Gilded Age America." Julien's Journal 22 (January 1997): 22-24.